Hotel Cerna Bouda is an ideal hotel for active holiday in the Giant Mountains National Park. It is a starting place for hiking and mountain biking around Cerna hora (Black mountain). 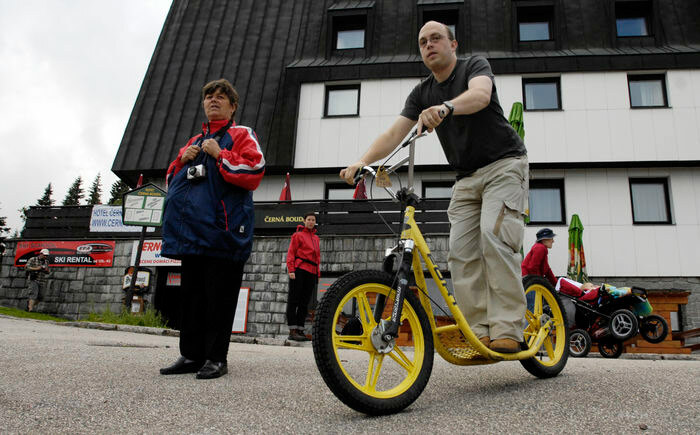 Combined with the central location and reasonable rates, these qualities make hotel Cerná Bouda and its surroundings one of the most sought-after recreational places in the east part of the Giant Mountains. Cyclists certainly appreciate many routes starting directly from the hotel on the top of Cerna hora and end it up by cableway ride from Janske Lazne (transportation of bicycles is FREE of charge). 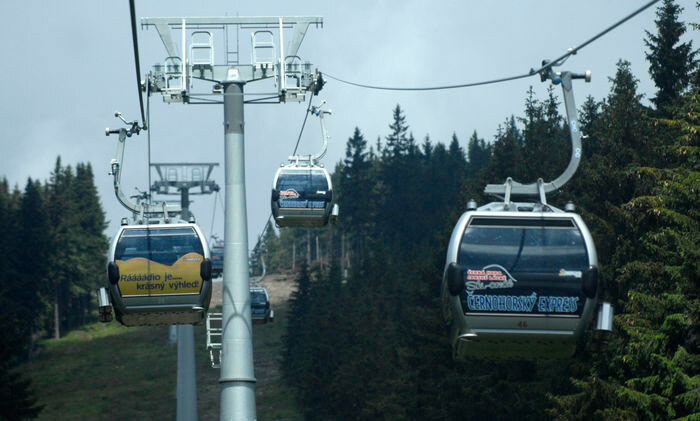 The route goes from the top station of the cableway on asphalt way to Zinneckerovy Boudy, then turns to the left, goes through a forest way in hill-side of the Black Mountain above Tesny dul to Janske Lazne - hotel Lesni dum. The route goes from the top station of the cableway on asphalt way to Zinneckerovy Boudy (red touring sign), then it curves to the right, hill-side of Cerna hora, then it curves to the left below Zrcadlovky. You turn to the right on the crossways - yellow touring sign, direction to Hoffmanovy Boudy, then you cross the main road and continue on green touring sign. You come to the low station of the cableway in Janske Lazne. The route goes from the top station of the cableway - red touring sign around Sokolska and Cerna Bouda to Vaclavak. The route continues in hill-side above Javori potok (Javori stream) to Kolinska and Prazska Bouda, then on yellow and blue touring sign to Pec pod Snezkou. The route goes from the top station of the cableway (red touring sign) around Sokolska and Cerna Bouda above Vaclavak, turns to the right on yellow touring sign around Cernohorske raseliniste to Peticesti. From Peticesti to Vlasske Boudy, here you can find a milk farm of the Sosna's family. The route continues on yellow touring sign to Velka Upa. 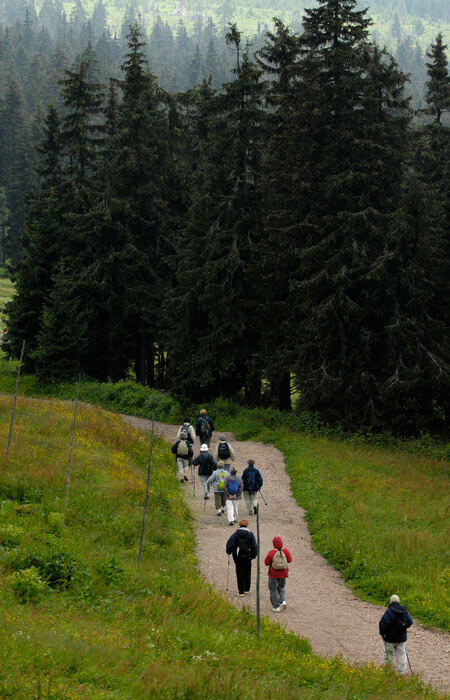 This natural trail was established in June 2001 and goes through the most interesting places of the Cerna and Svetla hora. Basic track of natural trail goes as follows: crossroads below Cerna Bouda - Zrcadlovky - saddle below Kolinska Bouda - Vaclavak - Peticesti - Vlasske Boudy - Krausovy Boudy - u Modrych kamenu - Velke Pardubicke Boudy - crossroads below Cerna Bouda. Track goes from the top station of the cableway on asphalt way to Zinneckerovy Boudy, after a sharp turn to the right there is a long cross trail through the hillside of the Black Mountain which turns to the left below Zrcadlovky then. Then it continues with a long cross trail again which goes to the crib of Administration Giant Mountain National Park, after a sharp turn to the right and a straight stage you come to Hoffmanovy Boudy /touring sign MTB Nr. 19A/. Than you turn left to the main road and you come to the low station of the cableway in Janske Lazne. Track goes from the top station of the cableway around Sokolska and Cerná Bouda to the crossroads below Cerna Bouda /touring sign MTB Nr. 19A, 1B/, here you turn right. You go through a straight stage in the length 300 m and you come to the crossroads above Velke Pardubicke Boudy, here you turn left /touring sign MTB Nr. 1B/, you continue around Velke Pardubicke and Krausovy Boudy to Modrokamenna Bouda. Then you continue on the tour MTB nr. 27, you go down to Janske Lazne, beyond hotel Lesni dum. Track goes from the top station of the cableway around Sokolska and Cerna bouda to the crossroads below Cerna Bouda /touring sign MTB Nr. 19A, 1B/, here you turn left and continue in the 1. Giant Mountain cycling nature trail. When you go down from Zrcadla to the saddle below Kolinská bouda you turn left, to route /touring sign MTB Nr. 19B/ which goes through the hillside of the Black Mountain below Zelezny dul to Zrcadlovky. Than you go to Cernohorská silnice - road /touring sign MTB Nr. 19A/ and you go down to the crib of Administration Krkonoše National Park, after then you turn right and go straight to Hoffmanovy Boudy. Here you turn left to the main road which goes to the low station of the cableway in Janske Lazne.